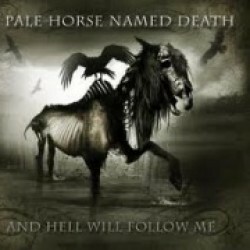 A Pale Horse Named Death, the band featuring Brooklyn, New York native Sal Abruscato, who played drums on three Type O Negative albums ("Slow, Deep & Hard", "Origin Of The Feces", "Bloody Kisses"), as well as four Life Of Agony releases ("River Runs Red", "Ugly", "River Runs Again", "Broken Valley"), on guitar and vocals, will release its sophomore album, "Lay My Soul To Waste", on May 21 in North America, May 24 in Germany, Switzerland, Austria and May 27 in the rest of Europe via Steamhammer/Spv. The group has once again commissioned famed artist Sam Shearon (a.k.a. Mister-Sam; Rob Zombie, Fear Factory, Rammstein) to create the artwork for the Cd, which was mastered on January 17 by Ted Jensen at Sterling Sound in New York City. According to a press release, "Lay My Soul To Waste" "keeps A Pale Horse Named Death's patented signature formula of slow, deliberate sludge and head-down doom intact and as flawlessly executed as ever. Think Alice In Chains, only harder, angrier and with a more perverse view of the world, as if they were reared in a row house in Bensonhurst, as opposed to the rainy landscape of Seattle, all the while feasting on a steady diet of Black Sabbath records." Abruscato is open about the fantasy that dominates his lyrical point of view. He admits that all songs "have a line to realityâ€¦things that could and do happen every day." But like any skilled storyteller, Abruscato likes pushing buttons. His lyrics are no different than the narratives of the horror movie playing at your local multiplex. It's largely fiction, with some nuggets or kernels of truth embedded within. Musically, the record matches that pallor and "will hit you in the gut." There are more harmonies this time out, and the piano is a bit more front and center, while guitarist Eddie Heedles contributed some leads. But for the most part, the formula remained largely untouched. "If it's not broken, don't fix it,'" Abruscato said, matter-of-factly. "We wanted to display the advancements, musically and artistically, and retain the core element."